Browser content redirection (BCR) allows the redirection of VDA-side browser viewports to the client-side. The benefits of BCR are achieved when offloading network utilization, page processing, graphics rendering to the endpoint, and improving end-user experience when browsing demanding webpages; especially those incorporating HTML5 or WebRTC video. Google Chrome: The VDA-side Chrome browser viewport is redirected and rendered on the client-side using the Citrix Workspace app for Windows embedded Chromium engine and the HdxBrowserCef.exe process. 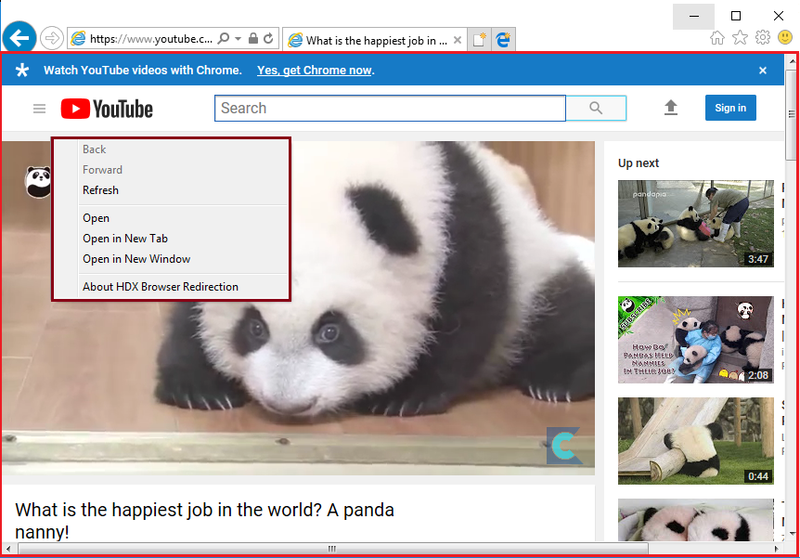 Note that the Browser Content Redirection Extension (which injects HdxVideo.js) must be installed and enabled on the VDA before using BCR with Chrome. The Browser Content Redirection Extension is available from the Chrome Web Store. For further information, including BCR system requirements, please read the Browser content redirection section of the Citrix Virtual Apps and Desktops 7 Product Documentation. No VDA-side viewport redirection to the client occurs. This could be due to the desired behavior as configured through BCR policies, or server fallback may have occurred unintentionally due to a client redirection failure. Browser content redirection policy: If set to Prohibited, BCR is disabled. Alternatively, if “server fetch and server render” is to be applied for some websites, while permitting BCR for others, use the Browser content redirection Access Control List (ACL) policy settings policy to whitelist sites and/or the Browser content redirection blacklist setting policy to blacklist sites. In this alternative scenario, the Browser content redirection policy needs to be unconfigured [since the default value is Allowed] or set explicitely to Allowed. This scenario is useful when the client does not have direct access to the internet. When the Browser content redirection proxy setting policy has been configured with a proxy server IP:Port address, the client connects to the proxy server on the VDA’s network over the Port Forwarding virtual channel and renders the content locally. Proxies that require explicit authentication are not supported. On a Linux client, also check if vdbrowser.dll and vdportfoward.dll (used for server fetch client render) have been loaded. If they are not loaded, the redirection will fail and fallback to server-side rendering. Be aware that there are many Citrix Virtual Channels that can run under CtxSvcHost (Smart Card, Audio, Flash, etc). The one used by Server Fetch Client Render in Browser Content Redirection uses the “PortFwdSvcs” flag, as seen above. You can also use TCPView – but make sure you are tracking the right CtxSvcHost. You can use the PID value from Process Explorer (9196 in the screenshot above) to correctly identify it, or look at the Remote Address and identify your Proxy. 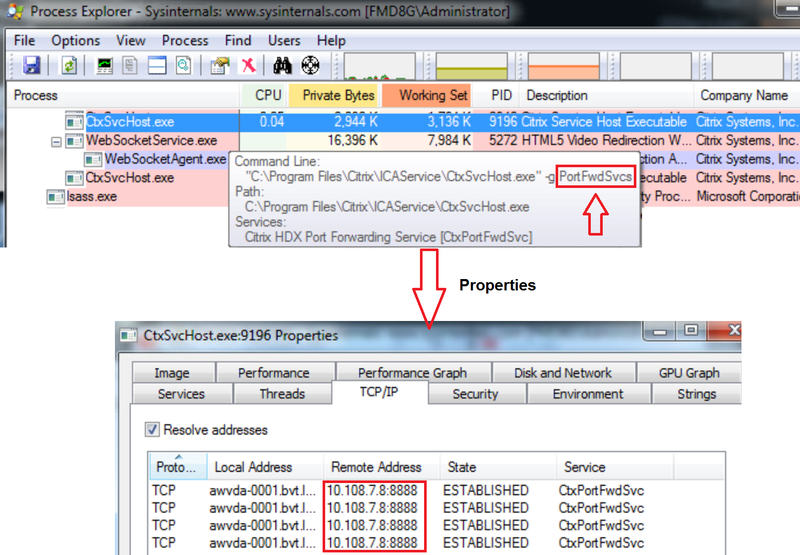 If CtxSvcHost.exe is not seen, please restart the service “Citrix HDX Port Forwarding Service” on the VDA. This use case affords the maximum benefits for bandwidth efficiency and VDA resource usage. Browser content redirection Access Control List (ACL) policy settings policy: Acts as whitelist. Add any websites (wildcard * can be used) that you want to be redirected. To support whitelisted websites that navigate away to a 3rd-party site for authentication before redirecting back to the whitelisted site, configure the Browser content redirection authentication sites policy. 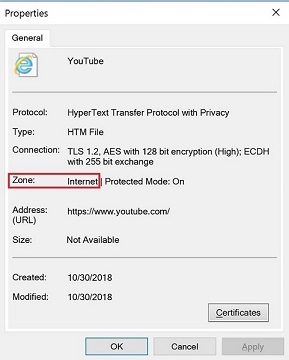 The Sign In button on the YouTube site navigates to https://accounts.google.com/… (the protocol/domain part will be consistent but the full path will vary). In the Browser content redirection authentication sites policy, add the entry: https://accounts.google.com/* (note the wildcard * to accommodate variations in URL sub-folder values). More info can be found in CTX238236. Websites that use Integrated Windows Authentication (IWA) might break BCR. Currently BCR is not able to handle and display the pop-up “Windows Security” dialog box (or any dialog box), and the user might end up in a blank page. Keep in mind that since now the endpoint is loading the website, the endpoint and website (running on IIS for example) might not be in the same domain (while VDA and IIS might). Hence IWA fails, a pop-up window should be displayed prompting the user for credentials but it is not, because of the aforementioned limitation in BCR. Citrix is aware of this limitation and targeting a fix. When freshly installing CVAD 1811, there is a known issue with BCR_x64.msi where it is not installed on the VM if the Admin selected “Enable brokered connections to a server” or “Enable Remote PC Access”. The workaround is to mount the .iso of CVAD, find the BCR_x64.msi in Image-Fullx64Virtual Desktop Components and run it. See CTX240182. Currently, copying text from redirected webpages is only possible with Chrome browser content redirection. Use Ctrl-C / Crtl-V to copy and paste. Currently printing from redirected webpages is not possible from Internet Explorer 11 and Chrome. Currently, screensharing functionality will not work if the BCR user tries to initiate screensharing. Incoming sreensharing does work (HDX-16273). Upgrades to Receiver 4.11 or 4.10 from any version might break BCR virtual channels. See CTX235183. Currently, if Local App Access is Allowed then BCR will not work. You must set LAA to Prohibited (Default) for BCR to work. Currently downloads aren’t enabled on redirected websites when using Chrome on the VDA (therefore files cannot be saved to the endpoint). In IE11, after starting a YouTube video using the YouTube HTML5 video player, full-screen mode might not work. You click the icon in the lower-right corner of the video, and the video doesn’t resize leaving the black background in the full area of the page. As a workaround, click the full screen button, and then select theater mode. This issue is not seen on Chrome. Before proceeding, please review the “Browser Content Redirection feature limitations” section. When using BCR with Internet Explorer 11, ensure HdxBrowser.exe is running with Citrix Workspace app for Windows (use Task Manager) while you are on a whitelisted site. When using Google Chrome, the process is called HdxBrowserCef.exe. For Linux endpoints (Fat Clients, or Thin Client minimum versions: Unicon eLux RP 6.2.3 CR, HP ThinPro 6.x and 7, iGEL OS 10.05) the process used is webcontainer (placed in ICAROOT /util folder. ICAROOT generally is /opt/Citrix/ICAClient for root user). ii. If it fails then you have to install WebKitGTK+ version greater than 2.16.6 for Browser Content redirection to work. WebKitGTK+ is a full-featured port of the WebKit rendering engine (WebKit2 API with GTK3). (This is not part of Citrix Receiver / Workspace app, so you will need to download the proper package for your Linux distribution and processor architecture, or contact your Thin Client vendor). This test verifies if the endpoint has the proper codecs available (specially the ‘ugly’ ones like H264). The test does not invoke any Citrix VDA components, it is a purely local test. Webcontainer (WebKitWebProcess) will in turn make calls to GStreamer 1.x – if H264 is not loaded, VP8 will be used instead (if the website supports WebM). In order to check your GStreamer version, run ‘dpkg -l | grep gstreamer’. More info on GStreamer requirements in CTX224988. Note: Currently, if WebKitGTK+ version is below 2.22.3, then Media Source Extensions (MSE) are not supported so YouTube videos will only play up to 720p (with H264). If H264 is not available or licensed, YouTube will attempt to use WebM container format (VP8/VP9 video codecs from gst-plugins-good and Opus audio codec from gst-plugins-base). YouTube now requires MSE to play videos in WebM format, so a proper WebKitGTK+ version has to be present. WebKitGTK+ version 2.22.5 or higher and GStreamer 1.14.4 or higher are recommended for YouTube. While webcontainer is in use, there are 2 associated WebKit processes that run: WebKitNetworkProcess and WebKitWebProcess. The actual network outbound connections are made by WebKitNetworkProcess). You should see traces from [HdxVideo.js] (example below). Collect the entire log. [HdxVideo.js] Showing content — suspendRedirection. This is caused by security configurations in IE11’s Security Zones, and the root of the issue is 127.0.0.1 being classified under the intranet zonewhile the redirected whitelisted site is in the internet zone. Redirection might work as intended on Chrome (since it has no concept of Zones). Internet Explorer automatically assigns all websites to a security zone: Internet, Local intranet, Trusted sites, or Restricted sites. Important: 127.0.0.1 will be classified as either Intranet or Internet zone, depending on your IE11 Proxy configuration in Tools > Internet Options > Connections > LAN Settings (either PAC files – WPAD Proxy Script-, or Explicit Proxy -manual-). More info here. If 127.0.0.1 ends up being classified as Intranet, then Zone elevation restrictions prevent connections from Internet zone to Local intranet zone, and BCR will fail. The Local intranet option “Include all sites that bypass the proxy server” should be unchecked (disabled). 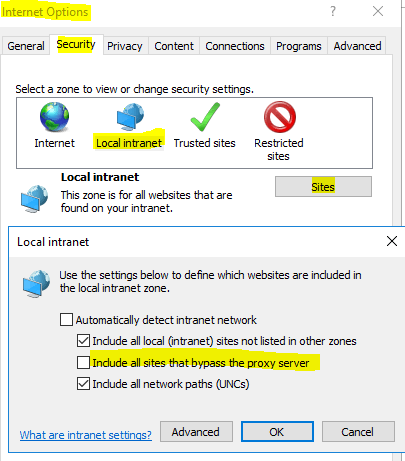 Rationale : If “Include all sites that bypass the proxy server” is enabled, 127.0.0.1 connections are considered to be in the Intranet zone. Zone elevation restrictions prevent connections from Internet zone to Local intranet zone. Most of the external redirected sites like Youtube will be in the Internet zone and the injected script HdxVideo.js will attempt a connection to 127.0.0.1:9001 in the Intranet zone which will be blocked. So, “Include all sites that bypass the proxy server” should be unchecked. Each zone has a different default security level that determines what kind of content might be blocked for that site. (Depending on the security level of a site, some content might be blocked until you choose to allow it). The expected output from the 2nd line, is ‘1’, which indicates that the WebSocket connection was successfully formed. 0 (CONNECTING) The connection is not yet open | 1 (OPEN) The connection is open and ready to communicate. The PAC file does not need to return DIRECT for 127.0.0.1:9001 (WebSocketService.exe on the VDA), IE11 makes direct connections for localhost/127.0.0.1 by default. Zone elevations restrictions might, again, prevent HdxVideo.js to connect to 127.0.0.1:9001, so make sure it is classified as Internet Zone (see 4.4). This can be overcome if you have a Proxy server in your network (like Bluecoat) and you are able to apply HTTP Rewrites. The BHO is not currently compatible with Enhanced Protected Mode in IE11. The value of the key is set to 1. This means the extension is enabled and users cannot change it. If changed to 0 , the extension will be disabled and users cannot change it. If changed to 2 , the extension will be enabled and users can enable or disable it in the browser’s “Manage add-ons”. 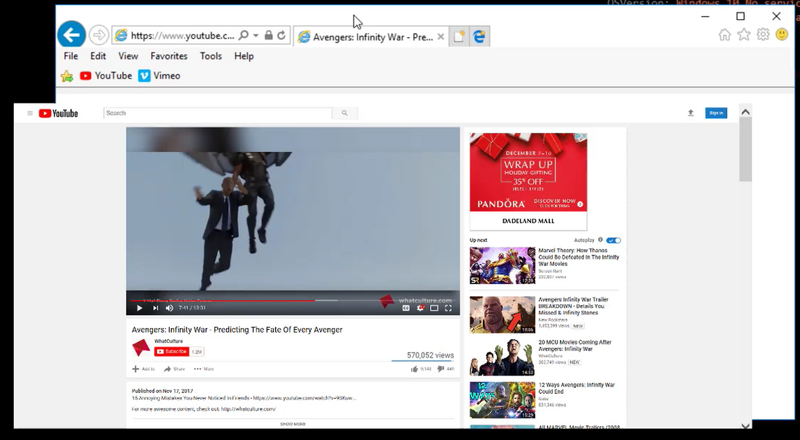 Method #1: Drag the IE11 or Chrome window quickly. You will notice a ‘delay’ or ‘out of frame’ between the viewport and the User Interface. Refresh: refreshes current client side web page. Open: if the mouse point is focused on a hyper link, the link will be opened; otherwise, nothing will happen.